For socialists and for antiwar forces, the events in Libya have presented — and continue to present — agonizing political and ethical choices. It is entirely logical and inevitable that thoughtful activists find themselves in disagreement among each other, and indeed in internal conflict within themselves, over questions raised by the Libyan popular uprising and by the military intervention of the western powers. Recognizing the difficulties of the situation is the essential first step for the international left to work through them. Solidarity supports the struggles against dictatorships in Libya and throughout the Arab world, and does not believe imperialist intervention can resolve the problems that have led to the revolts. We found ourselves in disagreement, however, on whether to oppose the Libyan rebels’ demand for a “no-fly zone” over Libya. Therefore, we are publishing two statements, each written by some members of our National Committee, representing the two main views of the Solidarity leadership. We do have clear areas of agreement, which we present not only as our own position but also as part of a necessary discussion within the left. Which side are we on? We are supporters of the Libyan popular revolt. This uprising takes place in the context of the “Arab spring,” the democratic revolutionary wave that began with Tunisia and Egypt and has spread to countries as diverse as Yemen, Bahrain, Jordan and Syria. At the same time, we believe that the liberation of nations and their people is the work of the people themselves, not of outside “saviors” and certainly not of imperialist powers. Despite whatever disagreements may exist within the international left and antiwar forces, we must remain unified in our unqualified opposition to the imperialist wars and occupations in Iraq and Afghanistan, our support for the struggles of the Palestinian people, and in our support for the democratic Arab Uprising — which is bringing new hopes for political freedom and social justice for tens of millions of people whose basic rights have counted for nothing in the world powers’ cynical games of oil and geopolitics. While the situation in Libya remains unclear, and the issues are complex, we believe that it is important to state some of the general principles which should guide us in our approach to this issue. To begin with, we support the movements for democracy and social and economic justice taking place in North Africa and Southwest AsiaÑthe “Middle East.” Throughout the Arab world, millions of people are fighting for freedom, and we are on their side. We do not believe that the Arab League, composed as it is largely of dictatorial or authoritarian regimes, can speak for the Arab world or the Libyan people. The Arab League states simply seek to protect their own economic and political interests against each other and against the rising tide of democracy in the region. Neither do we believe that the United Nations or the North Atlantic Treaty Organization (NATO) have legitimacy to speak either for the people of the world or the people of the Arab region. We oppose U.N. Resolution 1973, despite its reference to protecting civilians and human rights, since from the beginning its purpose and effect are to legitimate imperial intervention in Libya. France, Great Britain, the United States, and other European powers claim to intervene out of concern for human rights and democracy, but these claims are contradicted in practice. These nations support other dictatorial regimes in the Arab world and around the globe, even during the course of events in Libya doing nothing to stop the use of Saudi troops against protesters in Bahrain. They intervene in Libya due to their own economic interests and concerns for geopolitical control. 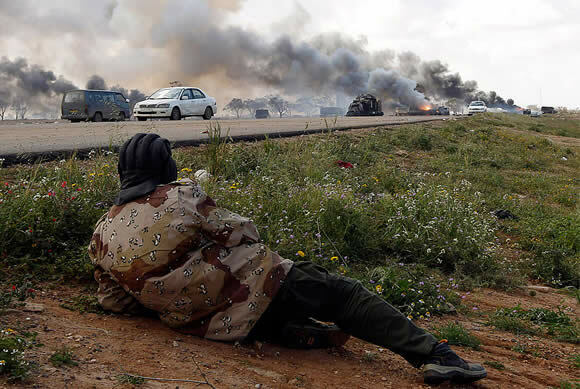 Qaddafi was already a willing client of empire, and Euro-American powers have intervened in the civil conflict to broker deals with disaffected and ambitious members of the Libyan elite who are backing the uprising. Power abhors a vacuum. The principal goal of the imperial powersÑFrance, Britain, and the US, whether individually or acting in concert as the UN or NATOÑis to dominate and shape the unfolding Arab revolution. As new governments form in the region and new political actors emerge in the course of the revolutions and uprisings, these powers will not stand idly by and let events take their course. The intervention is a show of force to an entire region but Libya was not chosen arbitrarily. The rebellion in Libya lacks the infrastructure of longstanding social movements and labor organizing that exists in neighboring Tunisia and EgyptÑwhere demonstrations continue and activists have given political expression to the left wing of the movements. The situation in Libya appears more pliant to the Euro-American powers. We oppose US-NATO intervention in Libya, believing that it will become another in the series of imperialist wars in the regionÑPalestine, Iraq, Afghanistan, Pakistan, and perhaps later IranÑall of which aim to increase U.S. and European power, not to bring democracy or freedom to the region’s people. The same powers that stood by as Lebanon and Gaza were laid siege to by Israel in the last decade are now adding Libya to a roster of countries attacked under the doctrine of “humanitarian intervention.” U.S. wars abroad are not good for those in other nations, and they are not good for the people of the United States. Civilian casualtiesÑframed as “friendly fire”Ñhave begun to mount and the Pentagon’s price tag for this intervention has already exceeded $500 million. Clearly, the revolutionary left in the US is small, and our relationship to the events in Libya is limited. We are not in a position to provide material support to the rebels. In practice, our influence is mostly limited to the issues we raise in the antiwar movement, the unions, and other arenas where we are active. The complexities of the situation in Libya can quickly be lost when reduced to slogans. Nevertheless, we think it is important that the antiwar movement tell the truth about this intervention, and we think it is the job of the US Left to tell the truth about our own imperialists. A people fighting for freedom have the right to seek weapons where they can get them. We support the right of the Libyan rebels to ask for weapons, military supplies, and other necessities from anyone, including the imperialist powers, regardless of the motives of the suppliers. Such supplies would allow the Libyan people to defend themselves against Qaddafi, empowering the insurrection. The US-NATO airstrikes do not empower the Libyan people. Rather, they begin a foreign intervention that’s likely to deepen and continue for some time. Freedom for the Libyan people will have to be won not only by their struggles but also by extending and deepening the revolutionary movements in North Africa and the Middle East. If there were a truly democratic Egypt under the control of its people, most of whom are workers, peasants and the poor, it would have the authority to help bring peace and justice to Libya. Most of all, we have hoped that the rebellion against the Qaddafi regime could open up the space for independent social movementsÑthe kind of forces that have pushed the revolutionary processes in Tunisia and Egypt forwardÑto gather ground. The longer the intervention continues, the more distant this possibility becomesÑit will serve to deepen the polarization of Libyan society between Qaddafi and the leaders to which NATO gives sanction. We continue to stand with the movements for democracy and social justice in North Africa and the Middle East, on guard against the imperial powers that work to influence and control those movements for their own interests. The principles of democracy, the right of peoples to self-determination, social justice and a spirit of internationalism will continue to guide our thinking and our work in solidarity with the Libyan and Arab revolution as it develops. We support the right of the Libyan activist-fighters opposing the Qaddafi regime, who liberated the eastern half of the country at the outset of the uprising, to request and receive international assistance. Our starting pointing in the current global context is what advances the Libyan people’s fight for freedom and the Arab Uprising as a whole. We do understand that there is, and will be, wrenching disagreement among the very best forces in the international left and antiwar movement about these issues. It is necessary to remember the real-world state of affairs immediately preceding UN Security Council Resolution 1973 and the intervention that followed. Until the last minute, it appeared that the popular movement’s desperate appeals for assistance (a “no-fly zone” and interdiction of the regime’s attack forces, not foreign troops) would go unanswered. The adoption of the hastily introduced UN Security 1973, in the view of some on the left, represents a calculated project of western powers to “recolonize” Libya. We believe, however, that there were a variety of motives. One of these was the prospect of chaos and mass refugee flight from Libya. Another was the pressure of popular opinion in the Arab world demanding that the impending slaughter be halted. Almost certainly, this pressure was a factor in the decision of China and Russia not to veto the resolution, and in the abstentions rather than “No” votes of Brazil, India and Germany. Among the intervening powers — mainly the United States, France, Britain and NATO partners — there are also a mix of motivations (France wanting to gain a greater commercial foothold in Libyan oil, the United States wanting to maintain its “global leadership” and dominance in NATO without taking serious risks, etc.). We don’t buy the mantra of “humanitarian intervention.” If, as president Obama claims, this intervention was to prevent a civilian massacre, that’s essentially because the imperialist powers feared the consequences of letting it happen — not mass killing in itself, which they have enabled or directly perpetrated so often. The fact that the imperialist powers’ motivations are neither humanitarian nor progressive, however, doesn’t negate the right of the rebels and the civilian population to protection from destruction. In this emergency, two slogans were raised in juxtaposition by some on the international left — “Support the Libyan Uprising! No to UN/NATO/U.S. Intervention!” We respect this attempt to pose a principled approach to the crisis, but we find the slogans to be internally contradictory since, in the context of the impending assault on Benghazi by Qaddafi’s overwhelming land, sea and air power, “No Intervention” would have meant not only the defeat of the uprising but the extermination of its supporters, their families, and anyone suspected of sympathizing with them. We do not propose an alternative set of slogans, because we don’t believe that a policy for the international left that addresses this crisis can be expressed in slogans. We do believe that the people of Libya fighting for survival against a monstrous and murderous regime had the right to demand assistance, and it would be unconscionable for the international left and antiwar movement — utterly lacking any resources or capacity, military or otherwise, to bring to their aid in our own right — to oppose that demand, despite our knowledge of negative consequences of intervention by the imperialist powers. There are such consequences, however, and we are also obliged to confront them. We do not endorse the UNSC Resolution, which is open-ended, imposes no military limitations on the intervening powers except for the prohibition of a land occupation, and is opaque on what does or doesn’t constitutes “defense of civilians.” Nor for that matter does it even recognize the right of the popular forces to arm themselves. The danger of Libya’s democratic revolt becoming a prisoner or pawn of the intervening powers does exist, and will tend to grow the longer the intervention lasts — and at this writing the duration of the crisis and the rapidly shifting political-military dynamics are difficult to interpret. But we do not believe the forces that rose against Qaddafi’s tyranny will readily exchange one overlord for another, even though that may be the orientation of part of the Transitional National Council in Benghazi. None of this is surprising. The Resolution and the intervention that followed came about through a complex combination of progressive pressure of the Arab peoples, regardless of the wishes of their governments, and decidedly non-progressive calculations of tactical and strategic interest by the imperialist states, which are divided among themselves. Nor does imperialism itself have any exit strategy at this point — and it is clear that the intervening powers do not want, and cannot sustain either logistically or politically, a protracted military campaign let alone a boots-on-the-ground occupation in Libya. The disagreements among these powers tend to reduce the dangers of the Libyan popular forces becoming their clients. The immediate political leadership of the rebellion is certainly drawn from bourgeois and elite layers, including exiled proponents of democracy but also some longtime figures in the regime’s political apparatus who have recently defected. These are the figures who appear to dominate the Transitional National Council, which issues press releases and names ministers while plebian and working class volunteers protest and fight. Not surprisingly, some of these new leaders are not revolutionary. Some are politically conservative and pro-western. And even among the revolutionary fighters there are contradictory forces. Most appear motivated by a genuine thirst for freedom and democracy. There are credible reports, however, that as Qaddafi has hired Chadian and Nigerian mercenaries to defend him, some rebel fighters have detained some Black Africans on spurious charges of collaboration and even inflicted violence against their captives. How widespread this is we cannot tell, but any such incidences are deeply disturbing and a threat to Libya’s democratic future. We should remember that workers from south Asia, the Middle East, and northern Africa, imported by the Qaddafi regime and deprived of all civil rights, represent as much as one-third of the workforce but are not allowed to join even the legally-constrained labor unions. And Qaddafi has cooperated with the Berlusconi regime to prevent African migrants from reaching Italian shores. We remain convinced that the first condition for overcoming racial as well as ethnic/tribal conflicts is the overthrow of the Qaddafi regime, and the opening of political space to mass movements which could challenge these divisions within the Libyan working class. A Qaddafi victory would cut off such a possibility. We do not care in any case what the masters may decide is or isn’t “in America’s global interest,” nor do we fantasize that imperialism ever will, or want to, or even can act with any kind of “moral consistency.” It’s entirely true, for example, that “the international community” — with no need for military action whatsoever — could put a stop to the worst atrocities of the Israeli occupation and the brutal siege of Gaza simply through targeted economic sanctions, and that this course is blocked by the U.S. veto at the Security Council. That and other acts of hypocrisy are points worth making, but tell us nothing of substance about the specific realities the left needs to confront in the Libyan crisis. For ourselves, we welcome the fact that the Libyan popular struggle has survived and we believe it will prevail — ultimately with an uprising in Tripoli to drive the final nail in the regime’s coffin — fully recognizing the dangers that the intervention poses to its independence and to the future that the Libyan people deserve. The victory of this struggle, whatever the intentions of imperialist states, will be a great boost to the mass movements that continue to erupt in Bahrain, Syria, Yemen and beyond.